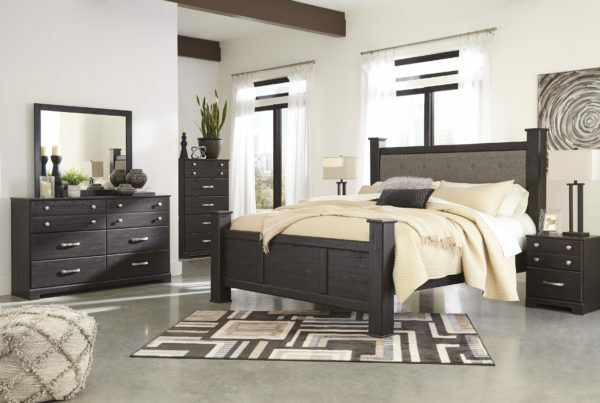 The Reylow poster bedroom set is turning heads with its clean, streamlined vibe. Dark brown finish has a gorgeous distressed effect, adding two-tone visual interest. Large drawers provide a ton of space for your belongings. Knobs and pulls with satin nickel-tone finish give this poster bedroom set a neat touch of shine. Dark brown replicated worn through paint finish. Large scaled satin nickel colored handles and knobs. Side roller glides for smooth operating drawers. Slim profile USB charger located on the back of the night stand tops. 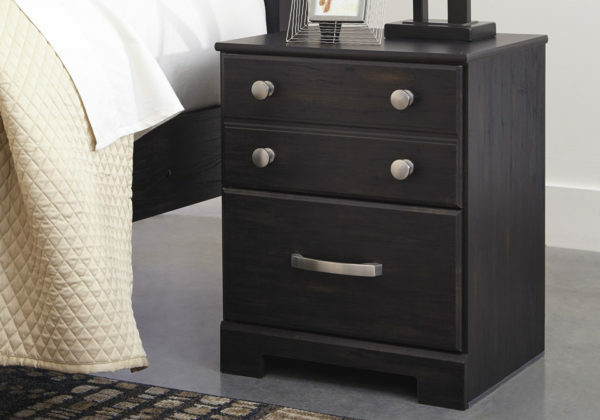 Large drawers provide ample storage space. Queen (67) and king (68) headboards feature an upholstered panel with button tufting details. Queen (65) and king (69) headboards can attach to a bolt-on metal bed B100-31 or B100-66 respectively. King and queen storage footboards (54S, 56S) require the use of the B100-13 or B100-14 roll slats respectively. King poster bed requires the use of the king poster headboard posts (62).